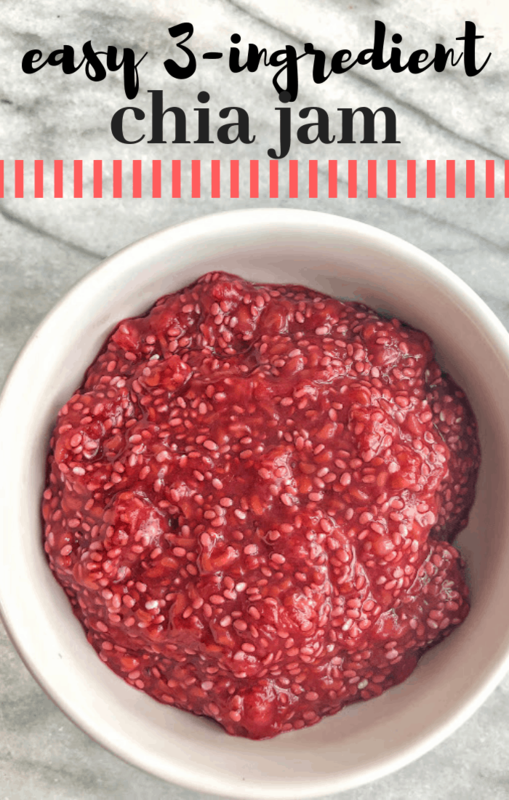 This is a simple recipe for easy chia jam made with fresh berries, natural sugar, and chia seeds. It can be made in less than five minutes. You guys. 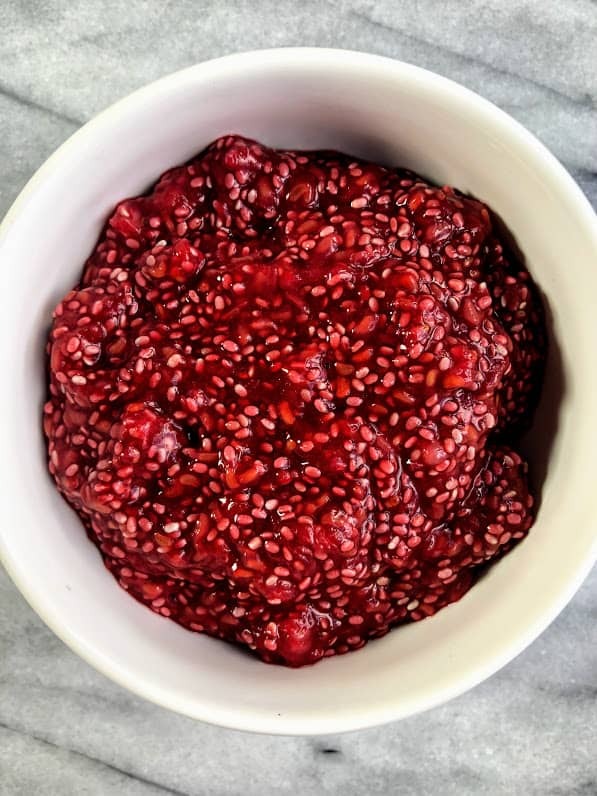 I am OBSESSED with this easy chia jam (made with only three ingredients!) and I honestly think I will never ever use regular jam again. 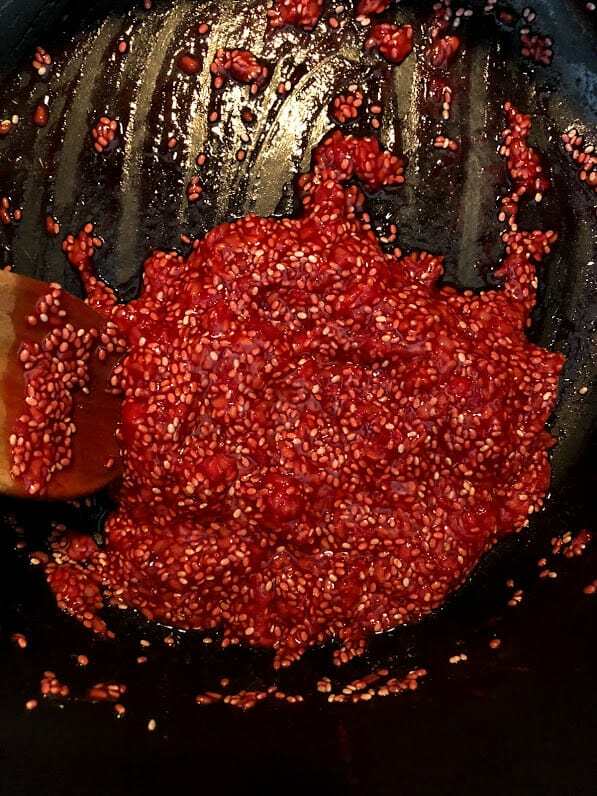 I’ve been making chia jam for a while, but I finally perfected the recipe and technique and I’m so excited to share it with you all! So why chia jam? Why not just eat regular jam or jelly? Well first off, those jams are typically loaded with sugar. Like LOADED. I grew up thinking that peanut butter and jelly was healthy, and while I don’t necessarily think its unhealthy (and hey, I like to live a little) I think that companies put far too much sugar in them. That’s what makes kids keep coming back, I get it. Companies can literally sucker you into to buying their products because as most of us know, sugar is addicting, and its tasty, and so people will keep buying it. 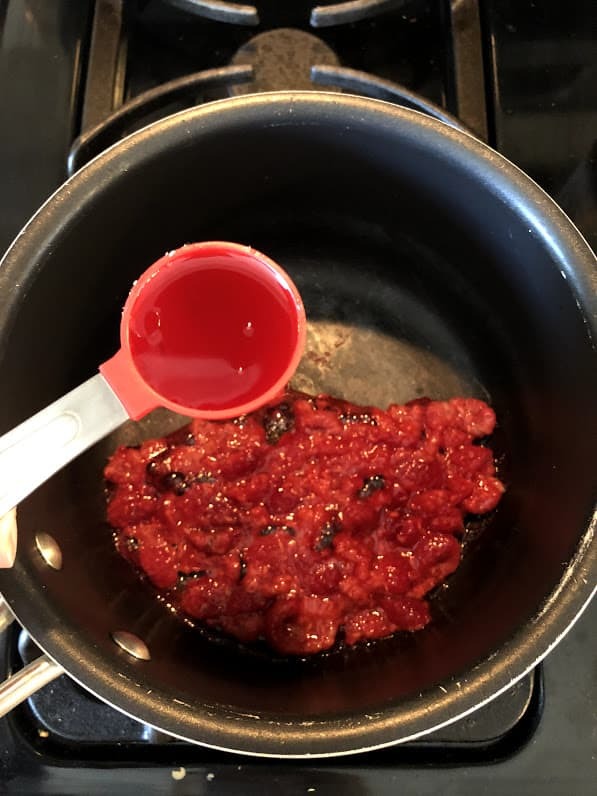 In regular strawberry jelly, the ingredients read as “Strawberry Juice, High Fructose Corn Syrup, Corn Syrup, Fruit Pectin, Citric Acid.” And in ONE tablespoon, there is 13 grams of sugar. That is a LOT of sugar that isn’t natural that I don’t want to be putting into my body. 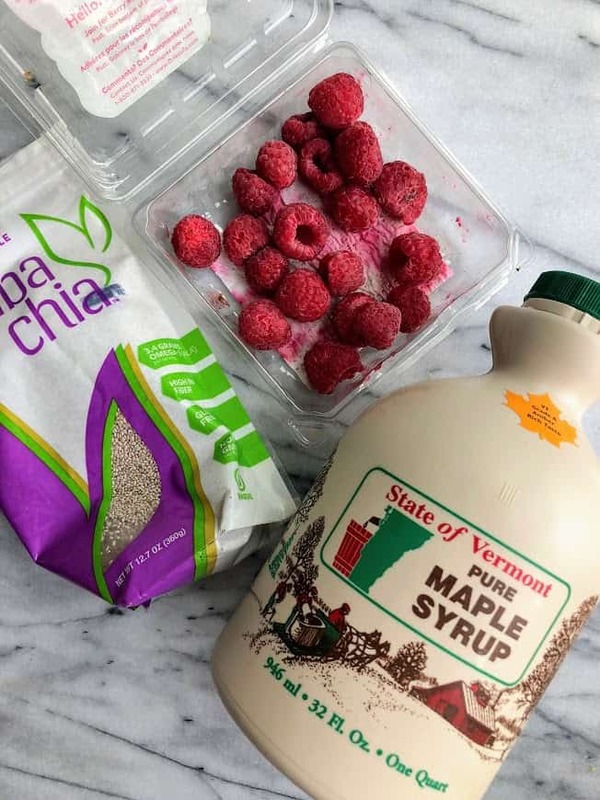 So in an effort to reduce the amount of sugar, I’ve been making homemade chia jam with just a hint of maple syrup, and have been relying on the natural sweetness from the berries. The maple syrup just adds the perfect little sweetness, but honey can also be used! In order to make it ‘gel’ and thicken, in comes the chia seeds. Chia seeds are little tiny black or white seeds that are full of fiber, omega-3 fatty acids, and protein. They absorb liquid and form a gel on the outside, causing them to thicken sauces or stews. For the fruit portion, this recipe calls for raspberries, but I’ve successfully made it with blueberries, strawberries, and mango! I think the possibilities are endless when it comes to fruit. The fruit can either be fresh or frozen, too. Either works and that’s what makes this recipe so awesome and flexible. It can be stored in the fridge for up to 2 months. 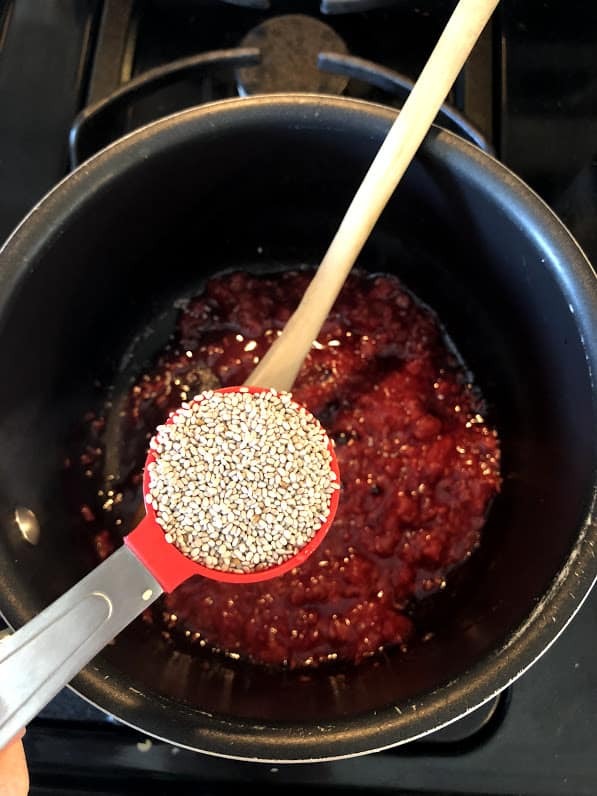 Just follow the below steps for this easy chia jam and you will never need to buy another store bought jam again! 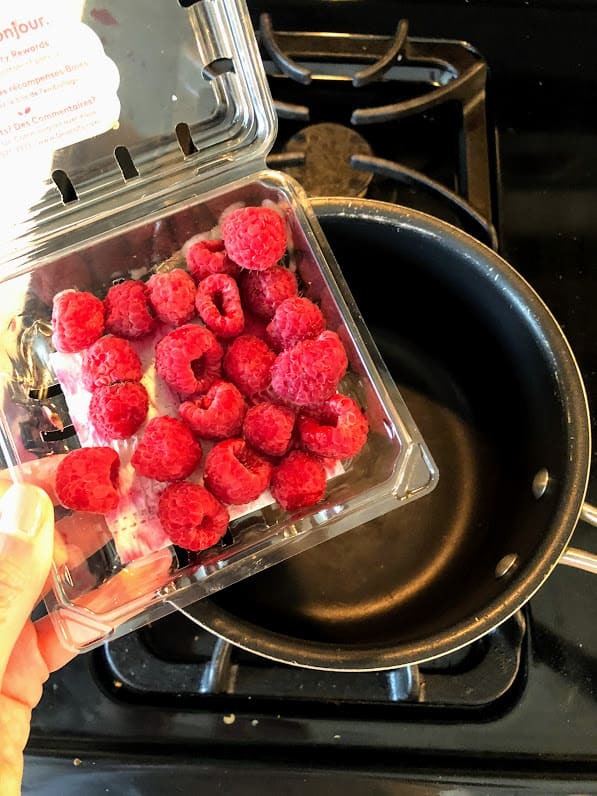 Add 1/2 cup berries to a sauce pan over low heat. Turn off heat and add in one tablespoon of chia seeds. Stir. Let rest for 5 minutes and allow to gel. Refrigerate if wanted. Add the fruit to a saucepan and turn on low for about 3 minutes, stirring occasionally. Once warmed, smash with the back of a fork. Turn off burner and remove from heat. Add in chia seeds and let “gel”. You can speed up the gel process by putting in refrigerator, but they will also gel by leaving on counter. Store in fridge for up to two months. Made this with frozen blueberries and turned out great. Very simple and quick recipe.